Well folks, week 22 has crept up on me, and due to a number of factors, I haven’t actually managed to do a lot this week! We’ve had some pretty great weather here in the UK, which is always cause to drop whatever you’re doing and enjoy it, because it won’t last! But some things have been done, so let’s take a look! 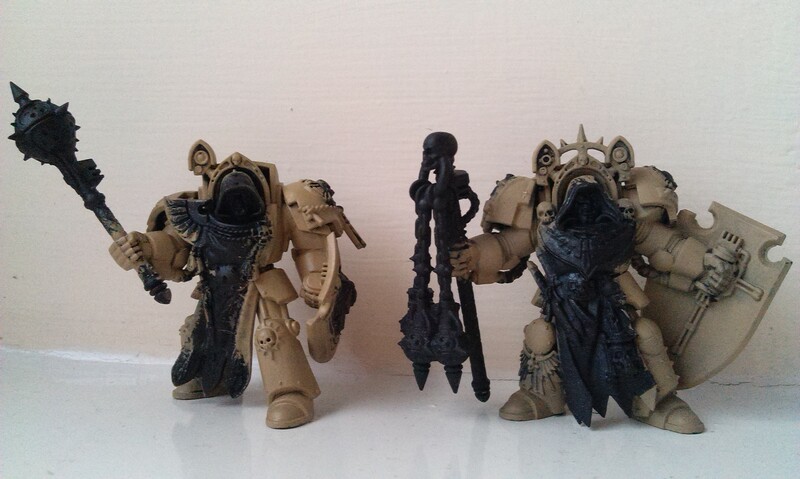 First of all, I’ve base coated two Deathwing Knights in Zandri dust. Not exactly cause for celebration, and I’m not exactly positive for these right now, given how long it took me to paint the regular Terminators, but I saw a post on instagram that inspired me to start work on these guys. I built up a five-man squad, along with Belial to lead them, back on Christmas Eve, and after the excitement of priming them, I’ve done nothing with them! Long time readers won’t be surprised by this, however. At any rate, I’m going to just plod along with these for the next few weeks, and see where I get with them. I enjoyed the Terminators, so hopefully I can say the same about these soon! 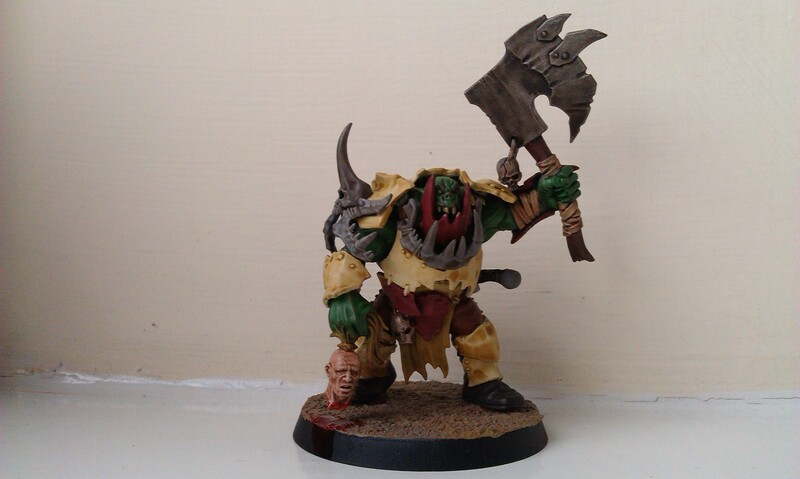 The main event, however, has been work on my Orruk brutes. I have got to say right now, I love these models, they are absolutely wonderful to work with! Of course, the arms lead to some fairly standard poses, and I don’t think I’d like to go with more than ten of them, at most, but they do look great. Like the Ogres of days gone past, but with much better detailing and stuff. I’ve been reading a Pathfinder novel for what feels like an interminable amount of time now (don’t be fooled, it’s actually really good – I’ll be doing a blog when I’m done, so stay tuned for that!) that mentioned a blood-red demon, and it really inspired me to paint something that way. After a conversation at my local store about how I dislike painting red, though disliked white more, I decided to kinda challenge myself to painting these guys with red skin. I have to say, I’m really quite pleased with the result. It’s a basecoat of Mephiston Red, shaded with Carroburg Crimson, and then lightly drybrushed with Astorath Red. I think my drybrushing technique has been akin to my general painting technique up to now, of just wanting to get the colour on the damn miniature as quickly as possible! So I really went for a lighter application, almost dusting it across the skin area, then a further dusting on the particularly raised parts, then a third dusting on the parts that the light would naturally hit. Finally, I made sure the faces were sufficiently highlighted, and voila! It’s difficult to see on the guy with the gore-choppa as the weapon covers most of his body, but the skin has a bit of a smoky-red appearance, perhaps enhanced by the black of the surrounding bits at the moment. This will likely subdue once the armour is done, as I’m painting mine as Stoneskulls so have that cream look, though with the odd Khorne red plate to mix things up. 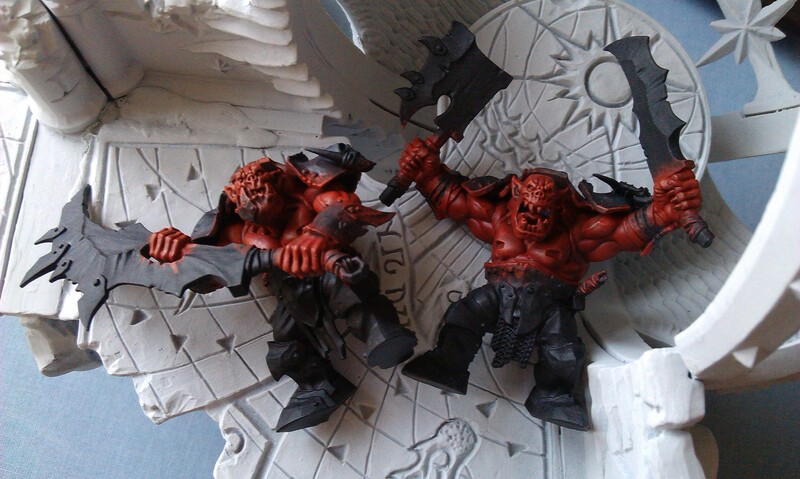 How that will work with the skin being red will remain to be seen, though the Khorne red is more of a burgundy kinda shade, so should hopefully stand out enough! At any rate, that’s pretty much it for this week. I did actually start painting last week’s Necropolis Knights, though made the mistake of trying the Corax White primer first. They’re chalky/grainy and, while it was only a light primer before I switched to Chaos Black, I feel that they might be ruined, which is annoying as hell due to their scarcity now! Enough of that, however – I’m going to concentrate on these Orruks, sprinkling in the Deathwing Knights, so hopefully there will be more exciting progress next week!